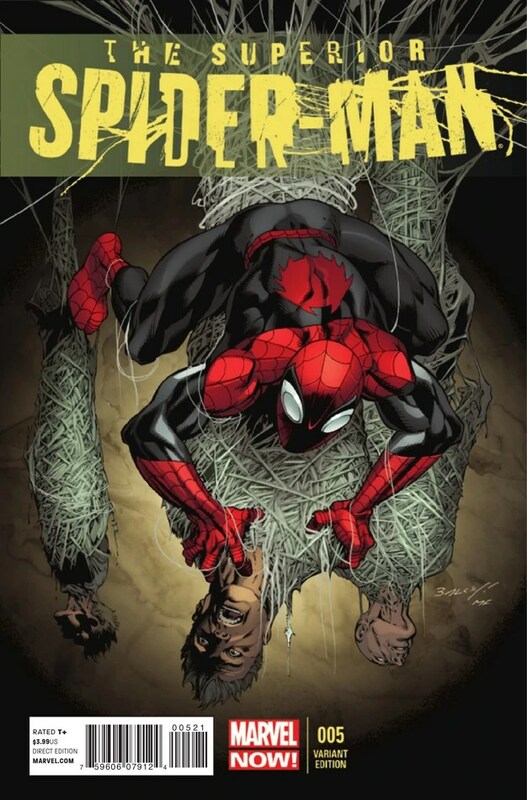 In case you missed it, this past week Marvel announced a relaunch of an old team with a brand new cast of superheroes. In September this year, an all-new Mighty Avengers will hit the stands, featuring one of the most ethnically diverse casts to see the shine of a single-issue cover. 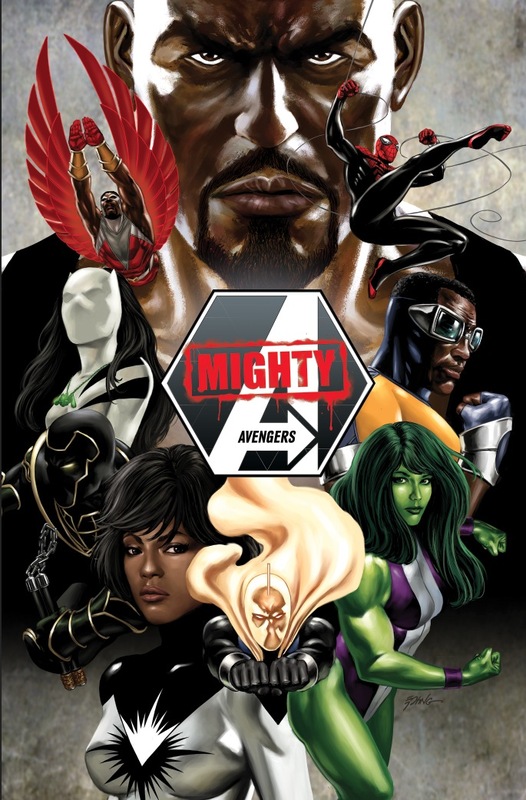 The team includes Luke Cage, Monica Rambeau, Blue Marvel, White Tiger, Power Man, Ronin, She-Hulk, Superior Spider-Man, and Falcon. That’s a long awesome list of superheroes from all over the Marvel universe, so we thought we’d give a little primer on who’s who for anyone who needs it. Also an excuse to talk about how awesome this team sounds! First appearing in 2008 in Adam: Legend of the Blue Marvel #1, a five-issue mini-series, Blue Marvel (aka Adam Brashear) is a relatively new character in the Marvel universe. Created by screenwriter Kevin Grevious (Underworld), Brashear is a former Marine and a veteran of the Korean War, and he has a PhD in Theoretical Physics. 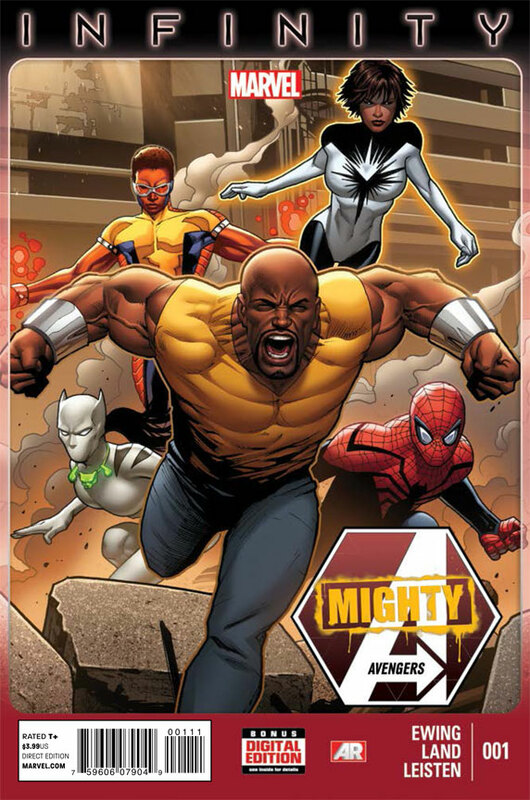 During an experiment to develop clean energy went wrong, Brashear is exposed to radiation that turns him into Blue Marvel, endowing him with some of the most incredible powers in the Marvel universe, including flight, regeneration and near invulnerability, super-strength, speed, stamina, and heightened sense. He can also absorb and manipulate energy in various ways He’s so powerful that he was able to go up against the Sentry, which, if you don’t know the Sentry, is a huge deal. Wearing a full-face-covering helmet, it was not known in the 60s that Blue Marvel was black. After this was revealed in an attack, then President John F. Kennedy asked Blue Marvel to retire, and the hero conceded. Coming to regret this concession later, Brashear returned to action. The Power Man title has been used by various superheroes over time, including Luke Cage back in the 1970’s. 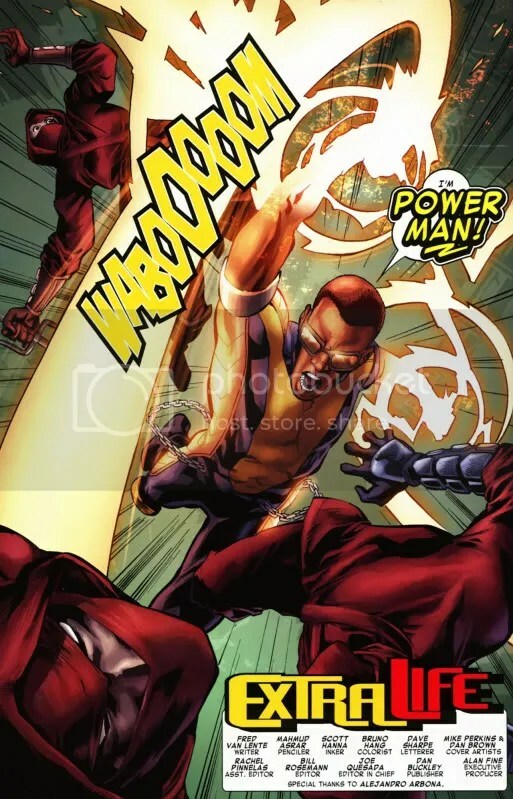 The current Power Man is Victor Alvarez who first appeared in Dark Reign: The List – Daredevil #1 in 2010, but doesn’t get his full story until appearing in Shadowland: Power Man#1, which ended after 4 issues. After surviving the deliberate demolition of his building, Victor began using his superpowers as a self-employed hero for hire and eventually took the name Power Man, which, naturally, caught Luke Cage’s attention. He’s been known to dislike Cage, considering him a “sell-out”, so the two working together in Mighty Avengers should be interesting… The son of a supervillain named Shades, Alvarez has the ability to draw energy from those around him thereby gaining super-strength and durability. He was most recently enrolled as a student in Avengers Academy and appeared in several issues of the now discontinued Avengers Academy series. Here’s another youngin… Several heroes have taken the White Tiger name. The current White Tiger is Ava Ayala, the younger sister of the first White Tiger Hector Ayala and her Latino heritage is very important to her. She first appeared in Avengers Academy #20 in 2011. She inherited the jade amulet that gave her her powers after her aunt Angela del Toro, the previous White Tiger relinquished the amulet. The amulet gives her powers of super agility, strength and speed, making her an incredible fighter. She also has the ability to camouflage herself. MONICA RAMBEAU! This superhero is a personal favorite, and one’s who hasn’t seen much action lately. After gaining her powers, Monica Rambeau initially went by the name Captain Marvel. She’s been through a saga trying get a name to stick and has gone through many, including Pulsar and Photon and now it looks like she’s going by Spectrum. Let’s hope this one sticks. Formerly a lieutenant in the New Orleans harbor patrol, Monica gained her powers when confronting a criminal trying to unleash a dangerous weapon. Her exposure to the explosion gave her the ability to transform herself into any form of energy and project that energy to inflict physical damage. These powers are incredibly powerful, but also taxing, and she can wear herself out and need to recharge. She was eventually recruited to the Avengers, becoming the first Black team member and eventually becoming the team’s leader in the 80’s. After temporarily losing her powers and returning to her hometown of New Orleans, Louisiana to work for the family business, Monica had a brief stint in her own self-titled comic, before going on to lead a team of C-level superheroes in the hilarious comic Nextwave. It’s good to see her kicking it with the big-guys again. One of the better known characters on the team and also, like Monica Rambeau, a classic Marvel superhero, Falcon first appeared Captain American #117 back in 1969 as the first Black American superhero in mainstream comics. Stan Lee was the co-creator of the character. Black Panther made his wing harness that allows him to fly, and the hero can boast being trained by Captain America himself whom he teamed up with in New York. He later joined the Avengers officially. Always having a strong interest in birds, Samuel Thomas Wilson adopted a wild falcon that he named Redwing. In a confrontation with the Red Skull, Wilson becomes empathically bonded with Redwing when the Red Skull used the Cosmic Cube. His affinity and bond with birds only grew over the years, making him more and more powerful. He now has power over all birds. He’s maintained a close relationship with Captain America and the Avengers throughout the decades. Jennifer Walters is Bruce Banner’s cousin. She became She-Hulk when she received a blood-transfusion from her cousin, giving her powers similar to the Hulk’s but at a reduced level. One of the busiest characters in comics, she’s been on numerous Marvel teams and is also a part-time lawyer, taking on mostly superhero-related cases and often engaging in activist efforts. After sorting out her own rage issues, she eventually decided to stay permanently in the She-Hulk state rather than changing back to her original appearance. After being accidentally exposed to radiation, her She-Hulk state became physically permanent anyway. She first appeared in Savage She-Hulk #1 in 1980 and has most recently been seen in Matt Fraction‘s FF filling in, alongside other superheros, for the original Fantastic Four members while they’re away. Another iconic Marvel character, Luke Cage has been a major player in the Marvel universe since his first appearance in his own self-titled comic in 1972 Luke Cage, Hero for Hire #1. Sent for prison for a crime he didn’t commit, he consented to an experimentation in exchange for parole, and, unpredicted by the scientists, the experiment gave him unbreakable skin. Upon being released he began using his powers for money, selling protection and heroics. He later begins working with the Defenders, before settling in with the Heroes-for-Hire team led by Iron Fist. Eventually he joins the New Avengers where he meets his now wife, and former superhero, Jessica Jones. After the two married and had a kid, he cut back on his superhero activities to be a dad and protect his family. The first Ronin was revealed to be Echo (aka Maya Lopez), when she was recruited to help out the New Avengers on a special mission in Japan. Hawkeye (aka Clint Barton) later took the name briefly after Echo was taken by The Hand. And finally Black Widow’s ex-husband Alexei Shostakov assumed the identity in an attempt to assassinate Black Widow. 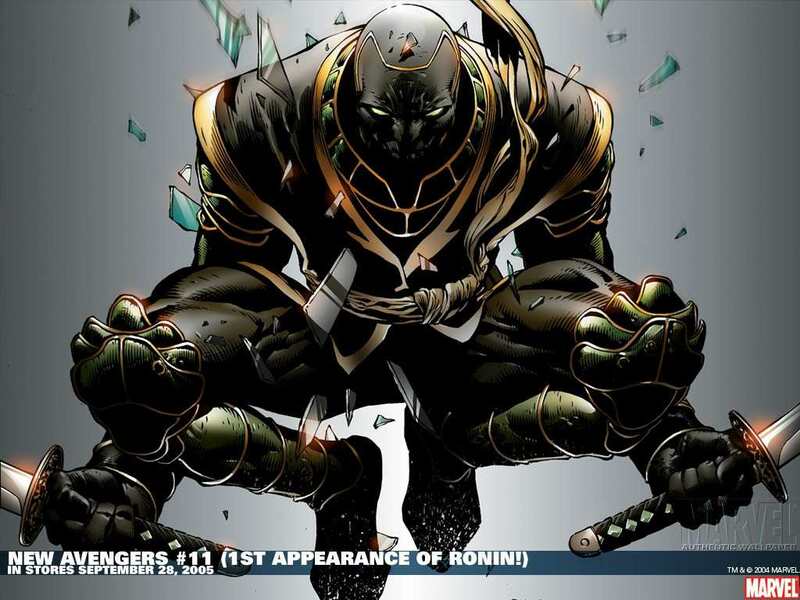 Marvel’s announcement indicated that there will be a totally new Ronin joining the Mighty Avengers this September… Who could it be?! Reblogged this on The Collective. I’m really looking forward to this book even though I really hate what they did to Monica’s hair.